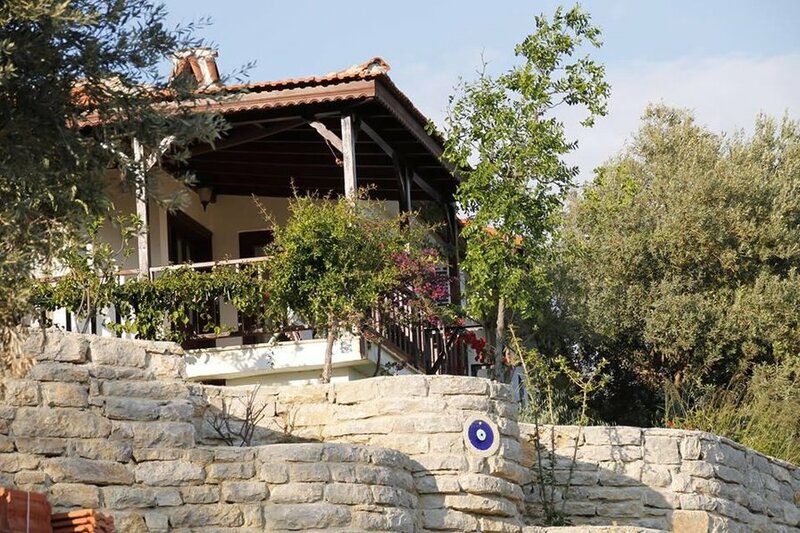 Lovely 2 bedroom house for rent with spectacular sea and mountain views in Mesudiye Village - Datça where Mediterranean Sea meets the Aegean Sea. Holiday house with breathtaking views. Two bedrooms (1 double, 2 single beds) with air conditioning, open plan kitchen + living room, modern bathroom, a big balcony with sea, mountain and village views. There is a spare sofa bed in the living room. Open plan, spacious living room+kitchen opening to the big balcony with excellent views. Well equipped kitchen with a large fridge/freezer and a washing machine. Modern bathroom with shower. Outside dining area and stone built BBQ by the house. Cot available on request. House is self catering and you can find all kinds of fresh, local food in the village shops or the restaurants. The house is perfectly located for easy access to several beaches and the village shops/restaurants or enjoying the peace and quiet of the countryside. The house is 1.5 kms away from Ovabuku and Hayitbuku Beaches and restaurants, 20 mins drive to Datca and Knidos. A car is advised but the house is by the main road and accessible by the local Dolmus service. Datça Peninsula is a prized location for tourists because of the beauty of its many coves and bays with crystal clear waters which are favoured ports of call for those undertaking the celebrated Blue Cruise along Turkey's spectacular Turquoise coast. Datca is also famous for its high oxygen level in the air and the low humidity. Even in the hottest summer months, a gentle breeze will allow for a pleasant stay. The sea and the coast line are stunningly beautiful and there are plenty quiet little bays where you can enjoy the peace and beauty. At the very tip of the peninsula the ancient Carian city of Knidos (Cnidus), home of the Cnidian Aphrodite stands, described by Strabon as 'a city that was built for the most beautiful of goddesses, Aphrodite, on the most beautiful of peninsulas. Mesudiye is the most beautiful village of Datca, covered with olive, almond and fig trees.